The Tate and the Royal Shakespeare Company (RSC) are calling for a premium to fund arts classes in England's schools. The major arts institutions say league tables and pressures on time and budgets are squeezing out important creative subjects. Six thousand 11 to 18-year-olds have described how the subjects help build their confidence, in new research. The government says it is investing almost £500m in arts and music. Creative subjects have been under pressure for a number of years, as many schools in England have devoted more time to core academic subjects. The Tate and the RSC want steps taken to redress that decline. They propose ring-fenced funding for arts and culture subjects through a premium similar to that already in place to fund sporting activities in primary schools. Erica Whyman, the RSC deputy artistic director, said she recognised the pressure on public spending, but there was a danger some teenagers were missing out. "I genuinely believe if we don't put money in to create a level playing field, not all schools can afford to give a basic entitlement of arts and creative subjects." The RSC works with almost 600 schools in disadvantaged areas and she added that in some, "visionary" teachers were keeping their subjects going despite diminished resources. Leading visual and performing arts organisations commissioned research which gathered the views of 6,000 teenagers in 30 schools across England about what they gain from creative subjects. 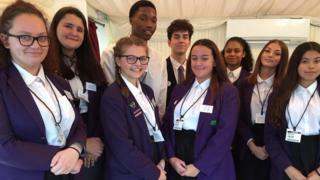 Students from Ricards Lodge High School, in south London, presented the findings at the House of Lords. Meghan, who is studying Btec drama, said: "It's a way of coming out of my shell and showing everyone who I truly am." She wants to become a police officer and hopes drama will give her the communication skills and confidence she needs. Ibrahim said music helped him express his feelings, while drama had built his confidence. "In drama I feel like I can be myself, I get to speak more, move around more." While their secondary school has maintained a range of creative subjects, other schools have struggled. The report says there are many pressures, from league tables to tightening budgets. It warns that elite universities have contributed to a decline in the priority given to creative arts, by not listing them as facilitating applications to study for a degree. Maria Balshaw, director of Tate, said that because they helped shape the future workforce, universities had a particular responsibility to champion how arts subjects built critical thinking and life skills. She said a group of FTSE 100 business leaders had made it clear they value creativity. "They need people who have the confidence to have ideas and work with other people to bring them to fruition." Sam hopes to be an actor, and is studying A level drama. "There is definitely a lot of pressure, even from when you are choosing your GCSES, when you're told the Ebacc subjects will help you get into university." The Ebacc, or English Baccalaureate, is a group of subjects including Maths, English, Science, a language and history or geography. The percentage of pupils gaining GCSEs in these subjects is one of the ways school performance is measured. The Russell Group of universities said its list of facilitating subjects was partly intended to level the playing field for pupils from families with little experience of choosing a degree course. A spokesman added that they were looking at providing updated advice through a new website tailored to specific subjects pupils might choose. "We will ensure the arts are well represented. The guidance will have a more personalised feel and we hope the site will be up and running by the end of the year." A government spokesman said: "Music and arts are a valuable part of the broad and balanced curriculum we expect all pupils to receive and Ofsted already inspects schools on this basis. "Music and arts are compulsory parts of the curriculum for children in state-funded schools up to the age of 14 and we expect all pupils to be able to study it as GCSE." Academy schools, which make up more than half of secondary schools in England, do not have to follow the national curriculum. The government also said it's investing in arts and music in schools, including £300m on music hubs to offer the chance for every pupil to learn an instrument and almost £120m to fund students to attend prestigious arts institutions.